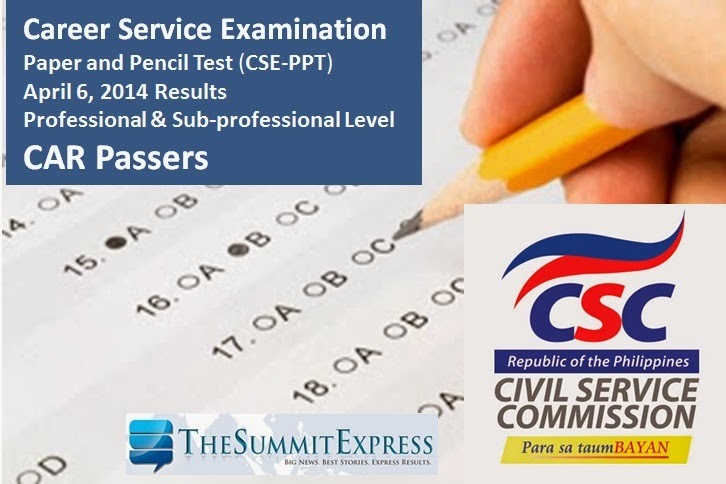 Manila, Philippines - The results of April 2014 Career Service Exam- Paper and Pencil Test (CSE-PPT) are finally out online on Monday, May 19, 2014. The Civil Service Commission(CSC) released the full list of passers per region for the Professional and Sub-Professional Examinations. Examinees of the April 6, 2014 career service exam in CAR (Cordillera Administrative Region) may now check results on this webpage. A total of 200,000 examinees took the Civil Service Examinations in 52 test locations nationwide, according to CSC.